Several configurations for the optical bistability of a nematic liquid crystal in a nonresonant cavity are investigated. These bistabilities result from optical feedback and occur below the Freedericksz transition. An electric-field-induced optical switching with hysteresis is observed as well. 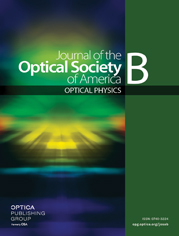 Photorefractive two-wave mixing in a KNbO3 crystal is used for amplification of the feedback beam, leading to an optical hysteresis with the pump beam of the photorefractive amplifier as the control beam. In this configuration competition between two beams injected into the nonresonant cavity (optical thresholding) is demonstrated: The stronger beam is identified and discriminated from the weaker one by bistable switching.